Fudge Haircare is an established salon brand with a reputation for style and creativity and products that can easily achieve results. Use Fudge Haircare to achieve the look you most desire with minimum hassle and maximum results, whether you are an amateur or professional it's simple with Fudge. Fudge is a diverse range of styling products and shampoos and conditioners that maintain the hair's health whilst giving you the best style that you could wish for. Combine and experiment with this vast range of products to achieve hair that is light years ahead of the crowd. Fudge Hard Stuff gives an extreme hold to all hair styles. 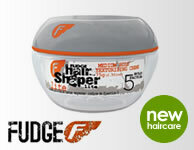 Scrunch, mould slick and style hair however you want with this fudge styling product. Scrunch, mould slick and style hair however you want with this fudge styling product with new mint fragrance. The styling tool for hair that is unruly and just won't stay put! Fudge Reform allows you to rework, reshape, distort and define with medium hold. Manipulate your hair to the maximum, with minimum hassle and without excessive sheen. For a really controlled hairstyle that has a firm hold and great volume. The putty formula is extremely pliable allowing you to sculpt your hair easily and effectively. The Fudge Hair Varnish is an ultra soft styling wax. Fudge Fuel allows tou to ignite your style with a moisture rush to feed and nourish the hair. A new formula hairspray, Membrane Gas is the perfect alternative to a styling paste. Pump Up is a styling tool provides maximum volume, body and gives your finished style ultimate holding power. Fudge Root Juice is a medium hold styling product suitable for all hair types. Fudge Body Booster is a volumising blow dry lotion for fine hair. Fudge Cement allows you to defy gravity with this extreme hold Fudge Cement! Erekt is really effective styling product specifically for curly hair provides advanced heat activated straightening. A heat-activated product that gives this hair type instant volume, bounce, shine and definition. One Shot + by Fudge provides instantly re-hydration and refreshment for dry and stressed out hair. Fudge Dynamite protein treatment is a moisturiser and conditioner rolled into one. Fudge Unleaded Skyscraper lets you quickly finish the job off with this medium hold aerosol spray. Fudge Unleaded Rewire is an easy to use leave-in moisture treatment that aims to rewire and rework dry hair. Repairs the hair by sealing the cuticle to prevent any moisture loss, a common cause of frizz. Fudge Head Bath is a lightweight 2 minute moisture masque that improves shine and overall condition. Fudge Daily Mint Hair and Body Wash allows you to blast your body and scalp with stimulating mint. Fudge Daily Mint Shampoo destress and detoxes your hair on a daily basis. Fudge Daily Mint Conditioner soothes, moisturises and calms tired, stressed out hair. Fudge Body Builder Shampoo gives fine and limp hair extra life and volume. Fudge Body Builder Conditioner gives fine and limp hair extra life and volume, health and shine. Fudge Smooth Shot Shampoo smoothes hair daily with this deeply hydrating conditioner.